Written by David H. Marion — At the end of Part 2 about one Albatross in particular (N44RD) and as a further example of the FAA’s own confusion about them too, I mentioned that there are also some serious issues with Type Certificate no. 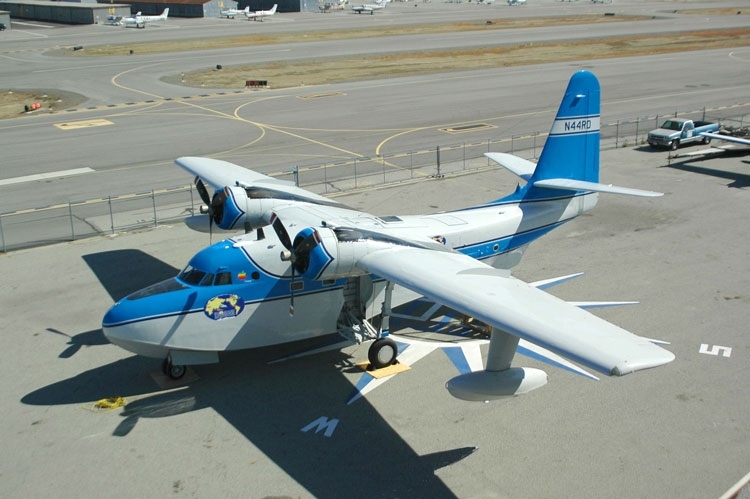 A33SO, under which many former military examples of the Grumman HU-16 series “Albatross” have been certified for civilian operations. I will get to that eventually, but first I want to do some actual Spotter’s Guiding and point out specific physical features that will help you identify different models of the Albatross. Just as with the model designation differences, it is actually much easier than you might think or realize. Obviously, the biggest and most significant difference between Albatrosses is in terms of wingspan – is it a “short-wing” or a “long-wing”? From some angles, that is obvious, but from others not so much. Sometimes too there is not a sufficient frame of reference to be able to tell one way or the other as well. In terms of planform, the view of the wing shape from the top, however, it is always easy. Almost all Albatrosses were built by Grumman originally as one “short-wing” variant or another, aka a design or model no. G-64 aircraft. As I mentioned previously, only the very last 21 aircraft, out of a total of 466, were built from scratch as long-wing variants. The factory conversion of a short wing into a long wing involved the installation of two constant chord (i.e. taperless) sections into an otherwise progressively tapering wing. The larger, inboard wing “plug” was added just outboard of the engine nacelles and was 70 inches long. The outboard “plug” was essentially just an extended tip just outboard of the aileron and it was another 30 inches. A total of 100 inches was added to each wing on each side of the aircraft. That’s 8 feet 4 inches per side or 16 feet 8 inches in total, which increased the overall wing span from the original 80 feet up to 96 feet 8 inches. In planform or as viewed from above or below, the extended “long” wing has a peculiar albeit slight “zig-zag” effect on the trailing edge. On the other hand, if the trailing edge is perfectly straight, then it is a “short-wing” variant of the Albatross. In addition to the straight versus “zig-zag” trailing edge, there is another difference in the main wings of the “short-wing” variants and the “long-wing” conversions. On the outboard leading edge of the short-wing (G-64) variants, there is a fixed aerodynamic slot to energize the boundary layer of air passing over the wing at higher angles of attack, but there is no such slot in any of the long-wing conversions or factory-built long-wing aircraft. Similarly, the airfoil section of the wingtip on the short-wing variants is similar to but just smaller than that along the rest of the wing and it is almost symmetrical between top and bottom surfaces. In place of the slot on the “short-wing” variants however, the outboard sections of the longer wings were built with a pronounced asymmetric camber, almost like a STOL leading edge cuff. Of course, the planform view is the least likely one to be photographed on the ground and it is also still somewhat rare of an angle to be captured even in the air. Fortunately there are several other little differences in the empennages (tail sections) of the short and long-wing variants, in their rudders and horizontal stabilizers in particular, that once you know about them make it easy to distinguish between a “short-wing” variant and a “long-wing” variant, even if you can’t see the main wing at all. Because of the additional lift produced by the longer wing, Grumman found it necessary to counteract that lift with correspondingly greater downforce on the tail. That was achieved by increasing the area of the horizontal stabilizers by increasing both their chord and span. As a result, whereas the leading edge of the horizontal stabilizers on the “short-wing” Albatrosses is just slightly aft of the leading edge of the vertical stabilizer, on the “long-wing” conversions, it is just forward of the vertical stabilizer at that point. Longer, fixed tips were added to each horizontal stabilizer too. The elevators on the earlier, “short-wing” Albatrosses spanned the entire trailing edge of each horizontal stabilizer and the ends curved to match the ends of the fixed stabilizers. In conjunction with the extended fixed tips of the horizontal stabilizers for the “long-wing” versions, the outboard ends of the elevators were squared-off to align with the inboard edge of the new fixed tips. Similarly, because of the greater adverse yaw possible with the longer wing, Grumman also increased the size of the vertical stabilizer and rudder on all of the “long-wing” Albatrosses. The rudder on an original “short-wing” Albatross runs the entire height of the vertical fin and the top of the rudder is curved to conform to the overall rounded profile of the vertical fin. On the larger fin for the “long-wing” version, the top cap of the fin is fixed and extends above the rudder, which has a flat top edge. Because of that, the rudder is probably the easiest and most visible indicator of whether any particular Albatross is a “short-wing” or “long-wing” variant. In terms of the empennage, the rule is simple; if the control surfaces have a straight hinge line extending all the way to the tip and have rounded ends, it is a “short-wing” Albatross, but if the tips are fixed and the control surfaces have a squared-off end inboard of the fixed tip, it is a “long-wing” Albatross. There is one other area in which there are some minor differences in various Albatross models or sub-types. As previously mentioned, the very last 21 aircraft off of the Grumman assembly line were built from scratch as “long-wing” variants. The first five of those were built for Germany as models UF-2 because they were contracted for through the U. S. Navy. They were followed by ten more aircraft for the Royal Canadian Air Force which were designated as models CSR-110 by the RCAF. Starting with those aircraft for the RCAF, Grumman made a change to the engine installations that also can be used to some degree for visual identification purposes. Up until factory serial no. G-448, Albatrosses were equipped with 1,425 hp Wright R-1820-76 “Cyclone” radial engines. Because the RCAF also already operated a fleet of Grumman S2F “Tracker” maritime patrol and ASW aircraft that were equipped with slightly more powerful 1,525 hp Wright R-1820-82 series engines, they were interested in establishing “commonality” in order to simplify maintenance and spare parts supply chains – so they asked Grumman to re-equip their CSR-110 Albatrosses with the exact same engines. Because the Tracker cowlings were slightly larger in diameter and the plan was to make the “firewall forward” Quick Engine Change (QEC) kits interchangeable, Grumman had to make new, larger diameter cowlings for the CSR-110 series Albatrosses. Visually, the “bulged” shape of the new, larger diameter engine cowlings is obvious. So too, while the earlier R-1820-76 series engines utilized updraft carburetors fed by air scoops inside their cowlings, the -82 series engines used downdraft carbs fed from new external scoops prominently protruding from top of the engine cowlings. Subsequently, the final batch of six model UF-2 Albatrosses built by Grumman for the Japanese Maritime Self Defense Force (JMSDF) were also equipped with the same, more powerful R-1820-82 series engines. Significantly too, more than half of the model G-111 Albatrosses that Grumman eventually rebuilt and converted to “modern” commercial (FAR Part 25) “Transport” category standards in the early 1980’s came from that very last group of aircraft to roll off of the original Albatross production line. Two of the five RCAF model CSR-110 and five of the six JMSDF model UF-2 aircraft were converted under the model G-111 conversion program in conjunction with FAA type certificate no. A22SO. All of the thirteen Albatrosses converted as models G-111, including the six that had been built originally with the -76 series engines, were re-engined with similar, 1,475 hp Wright model 982C9HE3 engines. These newer engines were basically “de-tuned” slightly less powerful, civilian versions of the military-spec R-1820-82 series, but they still had the same bulged cowlings and the top-mounted carb air scoops. The engines had to be “de-tuned” for civilian operations because they were expected to be run on standard “blue” 100 octane “low-lead” (100LL) aviation gasoline instead of the military standard “purple” 115/145 grade aviation gasoline that has never been readily available to civilian operators. For quite a while afterward, the top-mounted carburetor air scoops were one good indicator that a particular Albatross was one of the rare G-111 conversions that is eligible for commercial operations. However, eventually the “warbird” Albatross community started to run out of spare parts for their R-1820-76 series engines and they started to retrofit downdraft carbs and top-mounted air scoops to their -76 series powered aircraft. 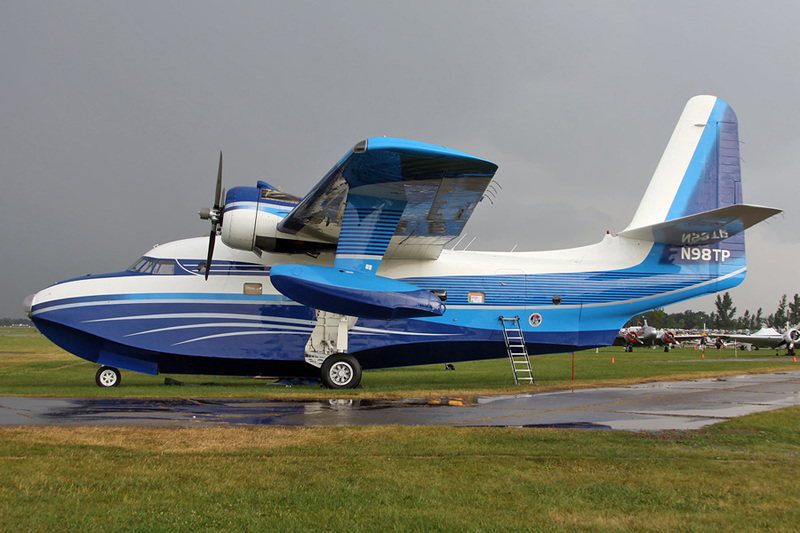 Consequently, it is now more common to find old HU-16 Albatrosses equipped with top-mounted air scoops for their carbs and to potentially confuse such aircraft with actual G-111 conversions. One final note of the G-111 conversions – besides the fact important fact of their re-certification for commercial operations under FAR Part 25, some of their other critical differences are not so easy to see. Probably the most important one is that their wings were (almost*) all rebuilt with lots of new parts including completely new titanium spar caps. While the “short-wing” Albatrosses never had a “life-limit” set for their wings, all of the military “long-wing” conversions did – ranging from 7,871 hours up to 9,855 hours Time in Service (TIS.) With the titanium spar caps installed, however, the “long-wing” model G-111 Albatrosses were freed from that kind of restriction. *For some strange reason, N112FB, Grumman G-111 serial no. G-463 (ex-USN Bu. no. 148328 and JMSDF no. 9055) did not get the new titanium spar caps and as such still has a “life-limit” of 8,900 hours TIS in effect for its wing structure due to its older 7075-T6 aluminum spar caps. Other modifications included in the G-111 conversion program focused on safety concerns for passenger operations. They included for examples new fire extinguisher systems for the engines (not so visible) and new emergency exit doors near the front of the main cabin, just behind the cockpit, which usually can be discerned in photographs and used to help identify the special G-111 series aircraft. In essence, this is pretty much an exhaustive list of the differences between the “short-wing” and “long-wing” Albatrosses. Aside from the ones that I have noted and special equipment such as the “Triphibian” keel and landing gear kits for Arctic operations, I have read that the only real differences between the various military service models other than the size of the wing had to do with radio equipment or avionics. In that regard and especially for purposes of civil registration and operation, it is almost inconsequential whether a short-wing Albatross was an Air Force model HU-16A or a Navy model HU-16C, or a long-wing Albatross was an Air Force model HU-16B, a Navy model HU-16D, or a Coast Guard model HU-16E. 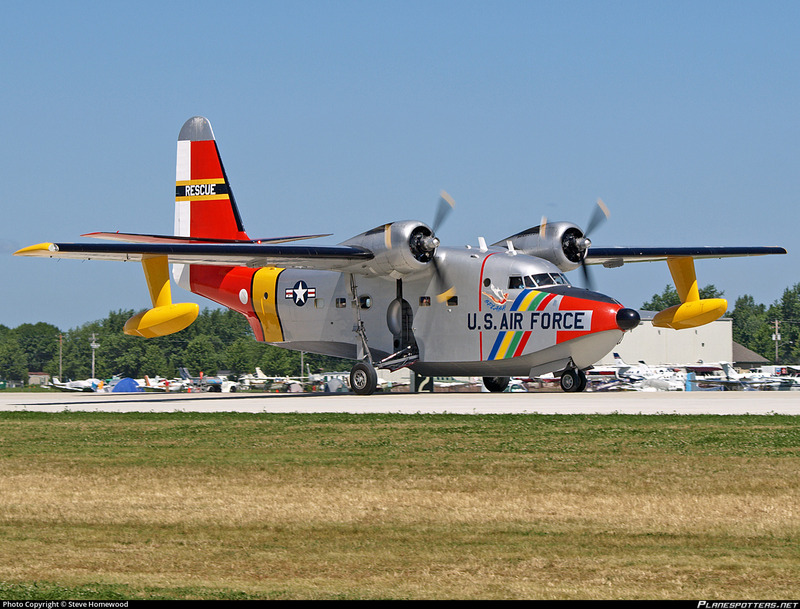 For an example, one currently airworthy civilian “warbird” example of an Albatross technically-speaking is a former U. S. Coast Guard model HU-16E, but its owner has it painted up in an especially colorful, Arctic SAR paint scheme used by the USAF – but that does not make it an HU-16B as it now appears to be. In spite of little “gotcha’s” like that, I hope this information has been helpful to all of you Albatross fans and enthusiasts out there!